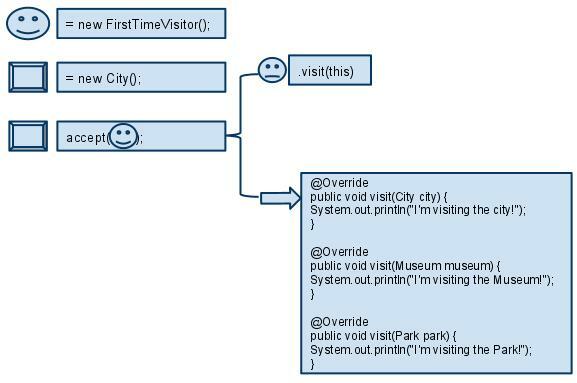 Visitor pattern is a design pattern commonly used in the parser of a compiler, such as Eclipse JDT AST Parser. Basically, there are two interfaces - Visitor and Element - in Visitor pattern. Suppose a first time visitor comes to New York City. He want to visit the city and the city accepts his visit. Once the visitor starts visit, it automatically visit everything, and he doesn't need to call a method when he wants to go to a museum. The travel is a package! This diagram shows the steps of visiting. 1. A visitor FirstTimeVisitor and an element City are created. 2. Program starts with "City accept a visitor". 3. The accept method in City defines that let this visitor to visit. 4. Accepted visitor call it's overloaded method "visit" to visit this City. 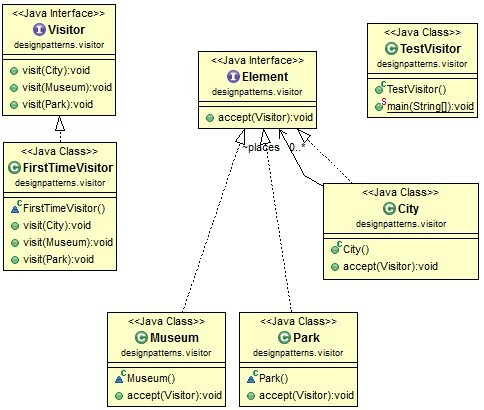 javax.lang.model.element.AnnotationValue obviously use Visitor pattern, but it is not commonly used in regular projects. Very useful post about visitor design pattern. I’m trying to integrate this pattern with Java cup to build an Abstract Syntax Tree, But it has been very difficult for me.